The TfL Board met on 4th February 2015 and approved the Cycle Superhighway CS5 and East West Cycle Superhighway projects moving towards implementation. The intention is to progress the CS5 scheme into the City of Westminster and along Vauxhall Bridge Road as far as the junction with Rampayne Street. The section of CS5 Superhighway between Pimlico and Belgravia is being developed in partnership with Westminster City Council. The Council is considering the responses to consultation and will consult on detailed proposals for this section of route in the future. This includes the possibility of splitting the route between Route 1 and Vauxhall Bridge Road. Having considered the consultation responses and undertaken further investigations, Westminster City Council considers that having a two-way cycle route along Belgrave Road, Eccleston Bridge, Eccleston Street and Belgrave Place (Route 1) is probably not viable, as it is likely to require the narrowing of the footways and loss of some well-used residents’ parking. Further discussions are therefore needed on a suitable alternative, which might include splitting the route between Route 1 and Vauxhall Bridge Road. We will be reconvening the meetings with Ward Councillors, local amenity societies and TfL to agree an appropriate package of measures to protect the Ponsonby’s area and to develop the Superhighway CS5 on local roads in the City of Westminster. The northbound route is likely to go along the Option 1 route (Belgrave Road, Eccleston Street and Belgrave Place) and the southbound route is likely to use Vauxhall Bridge Road. The challenge is providing suitable links to the southbound route on Vauxhall Bridge Road given the huge amount of development in the area around Victoria. Preparatory construction works are planned to start on 9 February 2015, including installing temporary traffic light supports along the length of the route and relocating a planter at Millbank to make space for a new westbound traffic lane at the junction of Vauxhall Bridge and Grosvenor Road. Main works are planned to start on 13 April 2015, and are due for completion in Autumn 2015. Over the course of the construction of CS5, there will need to be some road and lane closures as well as parking, loading and stopping restrictions in certain places. Fully signed diversion routes and traffic management strategies will be in place where appropriate. Footways, pedestrian crossings and cycle lanes will be kept open wherever possible during construction, but short-term closures may be necessary. Signed diversion routes will be available. Construction will be phased to minimise its impact on the traffic network, and will not affect all areas at all times. We will write to local residents and businesses before starting work in their area. Some road users and bus passengers will also experience increased congestion at certain times and places. We urge all road users to visit tfl.gov.uk/cs5 for the latest construction information and travel advice. While TfL does not expect a substantial increase in motor traffic in nearby residential streets, given the relatively low number of turning vehicles and availability of other routes, it does acknowledge local concerns over the potential for rat-running. To mitigate the risk, we are working with Westminster City Council (the responsible Highway Authority for John Islip Street, Ponsonby Place and Ponsonby Terrace) to put in place traffic-calming measures to deter additional traffic from rat-running. TfL is also developing a proposal to reroute northbound bus route 88 towards Camden Town, so it would use Millbank and Atterbury Street before joining John Islip Street. It would no longer serve bus stop S on John Islip Street, but would instead serve nearby bus stop T on Millbank. The route towards Clapham Common would not change. This would address local concerns about buses blocking John Islip Street at the junction with Bessborough Gardens. It would also improve bus journey times, as buses would bypass the traffic lights at the junction of Bessborough Gardens and John Islip Street. TfL will undertake a separate consultation with Westminster City Council, local people and bus users before any decision is made. TfL will also work to provide drivers with advance information to help them plan suitable alternative routes (see Appendix B of the Response to Consultation for further details). Scheme designs have been amended to provide a clearer layout for pedestrians and cyclists without the need for shared space. The revised proposals include a segregated cycle track at the junction, with clearly-marked space for cyclists and pedestrians. Clear signage and tactile paving will be provided where necessary to assist pedestrians and cyclists using the area. Several respondents questioned the proposed new location of bus stop D on Vauxhall Bridge Road to the north of Regency Street junction, saying there would be issues with space and sight lines. There was also a 73-name petition against the proposals. Following further investigations, we are now proposing to relocate the bus stop approximately 30 metres north of the Rampayne Street junction, outside 44-46 Vauxhall Bridge Road. Relocating the bus stop simplifies the junction layout at Regency Street, meaning buses are not pulling in and out at this junction. The relocated bus stop will also provide space for two buses to stop. Due to high pedestrian flows at the crossings over Bridgefoot, and in response to comments about crossing the cycle track, we intend to provide a zebra crossing over the track (subject to Department for Transport approval). The short westbound bus feeder lane from Vauxhall Bus Station to Vauxhall Bridge will be extended to make it easier for buses to join the general traffic flow going west over the bridge. 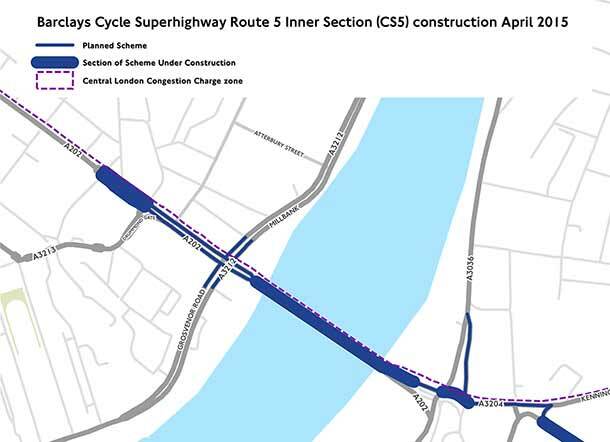 The full details plus maps are on the TfL Cycle Superhighway CS5 Programme of Works 2015 page. CS5 Cycle Lanes: A New Plan from Pimlico Residents. If you’re a Pimlico resident and would like to know more about FREDA or this website, why not join the Pimlico Neighbourhood Forum? Separator image Posted in Blog, FREDA, Planning and tagged with cycle, traffic, transport.